The primary purpose of utilizing a pair of steel toe work shoes is the protection afforded by the reinforced toe box against potential hazards. Hazards such as heavy objects, equipment, and personal protective equipment are essential. So owning a fine pair of steel toe work shoes — as found on this Top 20 Best Steel Toe Work Shoes for Men, Women in 2019 — is a critical decision so you can worry about the job at hand, not the protection of your feet. Many shoe manufacturers like to borrow from ideas prevalent in other shoe designs. And this is the impetus of what Keen has come up with when it comes to the Keen Utility Men’s Atlanta Cool Steel Toe Work Shoe. More a boot than a shoe, Keen has taken the best comfort, and rugged concepts and ideas from its popular hiking boots and morphed them into their excellent work shoe/boot line. Don’t worry; they’ve got the safety features you expect from a top-of-the-line steel toe work shoe. The toe cap is asymmetrical, as the vast box allows for plenty of room and the strength needed to protect from hazards. Inspired by their hiking boots, they have a metatomical footbed that has been designed to snugly fit your foot anatomically, and provide arch support which acts as a cradle for the natural contours of your foot. It’s ethylene vinyl acetate (EVA) dual-density footbed is removable, too. Keen’s CleanSport NXT technology protects against odors. It also meets and exceeds all American Society of Testing and Materials guidelines for safety in slip-resistance, compression and impact, and electrical hazards. The outer sole is non-marking, and the upper is leather and mesh and completely waterproof. Checking in at number two on the Top 10 Best Steel Toe Work Shoes for Men for 2019 is the Timberland PRO Men’s 40008 Mudsill Low Steel-Toe Lace-Up has a wonderful athletic design with the classic, rugged features you desire in a steel toe work shoe. Let’s start with the protective and safety features this exceptional shoe has to offer. The steel toe safety box meets and exceeds government standards set down by the American Society of Testing and Materials for compression and impact. It also meets and exceeds ASTM standards for electrical hazard protection, and traction as the outer sole is slip-resistant to wet and oily surfaces and conditions. The shoe comes with a cement construction for excellent flexibility and break-in time is minimal. The molded ethylene vinyl acetate (EVA) and Ortholite polyurethane (PU) midsole were constructed and designed for ultra-lightweight cushioned comfort. Odor-control has been added as well as the mesh lining has been treated with an antimicrobial agent. The upper is made of leather and a nylon mesh for breathability, and durability, comfort, and a nylon shank has been added to provide excellent structural support. The Ghillie lacing system was designed for a secure fit every time. 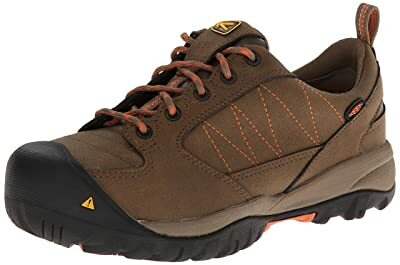 Keen returns to the Top 10 Best Steel Toe Work Shoes for Men in 2019 list with this offering, the Keen Utility Men’s Flint Low Steel Toe Work Shoe. Just one look at this beauty and most of you will be sold, but while that’s the general idea, let’s convince you with the dynamic and impressive features this steel toe work shoe has to offer. We’ll start at the top, and work our way down. The upper is made with a full-grain, Nubuck leather waterproof material built for extreme durability and comfort. The lacing system is traditional, but with a modern twist designed for a maximum, secure fit every time you lace them up. The steel toe safety box provides plenty of room for your toes with it’s asymmetrical and meets and exceeds government standards for compression and impact as set down by the American Society of Testing and Materials. The midfoot support is exceptionally comfortable thanks to the torsional stability shank (TSS). The footbed is removable and made with a dual-density, metatomical ethylene vinyl acetate (EVA) material. Odor protection has been added to Keen’s CleanSport NXT technology. The heel lock is contoured. And the outer sole is non-marking and oil- and slip-resistant. Timberland’s been around awhile and has a sterling reputation when it comes to rugged footwear. So for the next entrant to the Top 10 Best Steel Toe Work Shoes for Men in 2019, let’s check out the Timberland PRO Men’s Mudsill Steel Toe Oxford Shoe. Timberland’s PRO series is designed for specific purposes for folks who need safety protection on the job. And their steel toe work shoe option provides the toe box safety you need as the steel toe box meets and exceeds government guidelines as set down by the American Society of Testing and Materials (ASTM). The full-grain, leather upper is constructed of Titanium and Sapphire premium leather as well as a mesh material for additional support, comfort, and durability. The footbed is exceptionally comfortable and also made of an open-cell polyurethane material with an Agion antimicrobial agent for odor control. There’s also an internal nylon shank for stability, and the entire midsole is made with a compression molded ethylene vinyl acetate (EVA) material. Added comfort is apparent with Timberland’s PRO 24/7 comfort suspension technology. ASTM guidelines are also met with the abrasion, slip, and oil resistant rubber outer sole which also has the necessary electrical hazard protection. As we approach the halfway point of the Top 10 Best Steel Toe Work Shoes for Men in 2019, Skechers makes its first appearance — but not the last — on this list with the exceptional Work Footwear series they’re becoming more known for. The Skechers for Work 77055 Cankton Athletic Steel Toe Lace Boot has so many features built it that it’s impossible to do them justice in 200 words or less. Still, we’ll give it a try. Skechers boasts these steel toe work shoes are “true to size,” yet we always caution being extra careful when it comes to sizing, particularly if you need wide sizes or off or half sizes. These are available in wide widths. The footbed is exceedingly comfortable as Skechers utilizes the air-cooled memory foam technology. The footbed also has a relaxed fit, and the midsole is shock-absorbing. The safety features each meet and exceed government standards dictated by the American Society of Testing and Materials (ASTM), such as the slip- and oil-resistant outer sole which is also puncture-resistant. The steel toe box is compression and impact safety tested, and it meets guidelines for electrical hazards. The shoe is constructed with a waterproof leather with mesh insets and is ultra-lightweight. Skechers award-winning work footwear is well represented on this Top 20 Best Steel Toe Work Shoes for Men and Women in 2019 list, as is evidenced by the Skechers for Work Men’s Cottonwood-Cropper Steel Toe Work Boot. It looks the part of an exceptional steel toe work shoe, with its classic low cut design and sleek styling. The safety and protective features are excellent and meet and exceed all government-mandated guidelines as dictated by the American Society of Testing and Materials (ASTM). The steel safety toe box is protective against impact and compression, the outer sole is oil- and slip-resistant and puncture-resistant. The outsole is also adept for any type of electrical hazard, and the shoe is ultra-lightweight, despite the multitude of features. It comes in wide width sizes. The footbed is made with air-cooled memory foam and removable. The midsole is shock-absorbing for outstanding support. The collar is padded for long-lasting comfort, and the lining is made with a soft fabric for extra breathability. The lacing eyelets are metal, and there are rivets added to support durability. The upper is made of full-grain leather. The stitching is genuine to include side stitching which reinforces the seams. There’s an overlay heel stripe with a tab that’s pull-on. The Skechers brand of work shoe dominates this list of Top 20 Best Steel Toe Work Shoes for Men, Women in 2019, and for good reason: the shoe manufacturer simply puts its best effort towards its work footwear line, adding plenty of features in a stylish and comfortable shoe. The Skechers For Work Men’s Holdredge Steel Toe Work Shoe is no exception as it offers superior comfort, premium style, and exceptional safety. Offered in black only, the Holdredge is a perfect accompaniment to any uniform, and it looks and feels like an athletic shoe, yet safety conscious. That’s because it comes equipped with a composite safety toe box and a premier steel toe box, so your toes receive the maximum protection you need on the job site. The bottom outer sole is also made with an exceptional slip-resistant rubber material, resistant to water and oily surfaces. The outsole is also puncture-resistant and is American Society of Testing and Materials (ASTM) tested for electrical hazards. The shoe is phenomenally lightweight so that at the end of the day, you won’t be begging to take these shoes off. Finally, the upper material is made of premium leather and synthetic materials and it also offers superior waterproof protection. Caterpillar returns to the Top 10 Best Steel Toe Work Shoes for Men in 2019 with the Caterpillar Men’s Infrastructure Steel Toe Work Shoe. This marvel of work shoe construction is jam-packed with exemplary safety and protective features that are sure to keep your feet safe yet comfortable all day long. Let’s work from the bottom up and talk about the superior rubber outer sole first. The rubber is made to be slip-resistant against water- and oil-covered surfaces, and it’s made with Stroble-style stitching and cement construction for excellent safety. The outsole is also made to withstand electrical hazards. The platform measures 0.75 inches. The upper is made with a direct-inject polyurethane (PU) upper, and with a nylon mesh and suede material. The lining is also nylon mesh, and the sock liner is made with molded ethylene vinyl acetate (EVA) and Nylex. The Men’s Infrastructure is made to be ultra lightweight for maximum comfort and flexibility. It’s that rare work shoe that has the safety features and comfort you want in a work shoe yet looks and acts much like an athletic shoe. It’s designed so your feet will feel as fresh and healthy at the end of your work shift as they did when you left for work. MODYF’s lone entrant to the Top 20 Best Steel Toe Work Shoe for Men, Women in 2019 is the versatile and affordable MODYF Men’s Work Safety Shoes, Steel Toe Puncture Proof Footwear Industrial and Construction Shoes. OK, long name, but also long on safety features. One thing to understand, this is a European shoe so the safety features are European standards and while different than American, many feel European standards are superior. Either way, they have all the safety features you could want in a work shoe. This includes the rubber outer sole which is water- and oil-resistant, resistant to electrical hazards, and has a steel plate so it’s puncture-resistant. The steel toe box prevents pinching and is compression and impact-resistant, and roomy enough for your toes to have the flexibility you need. The midsole is made for extreme comfort with the shock absorber technology. The upper portion of the shoe is made of a durable and comfortable leather and mesh material and also has reflective strips which is great if you work or walk at night. The mesh liner was constructed for superior breathability. The footbed is metatomical and removable and made with a dual-density ethylene vinyl acetate (EVA) material. SAFETOE’s only entrant on the list of Top 20 Best Steel Toe Work Shoes for Men, Women in 2019 is the incredible SAFETOE Men’s Safety Work Shoes – L7296 Leather & Steel Toe Work Boots For Heavy Duty Work Wide Fit. There are literally too many safety, protective, and comfort features to be listed here, so we’ll cover the highlights the shoe manufacturer wants you to be aware of. A free pair of socks comes with the shoe, socks which are exceptionally breathable and comfortable. The SAFETOE is also made out of 100% genuine cow leather made with a unique unibody design and a color scheme to accentuate and complement any uniform or clothing. The sole is polyurethane (PU), which is used to add comfort, flexibility, and durability. Shock absorption technology in the removable insock allows for all-day relaxation and comfort. The steel toe box is constructed with extra width for exceptional comfort and room to move, so no pinching. These reliable and dependable work shoes are made with air holes for maximum breathability. The outer sole is constructed with excellent rubber that is water-, oil-, and slip-resistant and also comes with a steel plate so the sole is puncture-resistant. To start off the list of the Top 10 Best Steel Toe Work Shoes for Women in 2019 we present you the Keen Women’s Atlanta Cool ESD Safety Shoes. While the shoes on this list each can claim to be safety-conscious, not many have the safety feature of being electrostatic dissipative (ESD) (ESD) resistant. This allows for folks that work at work sites with computers or where static could cause fires or explosions to not have to worry about ESD. But that’s not the only safety feature in the Keen Utility Women’s Atlanta. It’s also protective in other ways. It meets or exceeds several safety standards as set down by the American Society of Testing and Materials (ASTM), such as oil-, water-, and slip-resistance, and the steel toe box is compression and impact resistant. The lacing system is secure-fit capture and the footbed is a removable metatomical dual-density technology with an ethylene vinyl acetate (EVA) midsole. The shoe is constructed with women-specific designs, fit, and comfort, and reflective webbing has been added for extra, nighttime security. The water-resistant shoe is made with Nubuck leather with a mesh liner to make this shoe exceptionally breathable, so much so, they’re sure to keep your feet cool and comfortable in any weather, even warm weather environments. Checking in at No. 2 on the list of the Top 10 Best Steel Toe Work Shoes for Women in 2019 is the Keen Utility Women’s Detroit Low Steel Toe Work Shoe. With the stunning look of an athletic shoe, the Detroit Low has all the features you’d expect to see in a safety, protective work shoe. It’s made of a flexible leather and fabric upper and is ultra-lightweight for all-day comfort. The webbing of the upper portion of the shoe is made with a reflective material for added safety and security, particularly at night. The steel toe box is American Society of Testing and Materials (ASTM) tested for compression and impact, and the steel toe box is also left and right foot asymmetrical, so your toes stay comfortable and protected every time you were them. The rubber material used for the outer sole is made with water-, oil-, and slip-resistance, and the outsole is also non-marking. There is a contoured heel lock and the exceptionally comfortable lining is made with two-zone comfort technology. Finally, the footbed is not only removable but made with an ethylene vinyl acetate (EVA), dual-density material. This is an extremely comfortable and durable shoe inspired by Keen’s top-rated hiking shoes. Ariat’s lone entry to the Top 20 Best Steel Toe Work Shoes for Men, Women in 2019 required some thinking outside the box. The Ariat Women’s Steel Toe Safety Clog — yes, clogs — is a beautiful looking work shoe that is slip-on easy, and jam-packed with safety and protective features. Designed to slip-on and go, they come already broken in, so you can just put them on and head to work with no worries. The upper is made of exceptionally soft, durable, and comfortable full-grain leather. The gorgeous stitching adds to the stylish leather look. A composite forked shank has been added to the overall construction which is Advanced Torque Stability (ATS) technology, which is designed to add all-day comfort. A full two-inch heel and a platform which measures half an inch allow for extraordinary stability. The outer sole has been developed with Duratread rubber technology which is water-, oil-, and slip-resistant and flexible. It also grips well and resists abrasions. Designed for a woman’s feet yet the safety features of the best safety steel toe work shoes. It also has an R Toe profile, leather lining, and meets and exceeds all American Society Testing and Materials (ASTM) safety test ratings. Another lone entrant of the Top 10 Best Steel Toe Work Shoes for Women in 2019 is from Dr. Martens. The Dr. Martens Gunby Steel Toe Shoe is part of their AirWair line of work shoes made to function on any work site as the safety and protective features are exceptional. These all-Grizzly leather beauties are water-resistant, tough, and exceedingly durable. The heel measures to about 1.5 inches for stability. Also with stability in mind, Dr. Martens has added soles made with polyvinyl chloride (PVC), a material which is shock-absorbing and excellent for a grip that is oil-, water-, and slip-resistant. The soles also meet and exceed the American Society of Testing and Materials (ASTM) safety standards for slip-resistance as well as soles that are electrical hazard-resistant to protect you from electric shock. The steel toe box is also ASTM-approved for compression and impact. The footbed is made of ethylene vinyl acetate (EVA) midsole which is designed for all-day comfort and also was designed for breathability and also has a moisture-wicking lining. The Gunby Steel Toe Shoe comes with British sizing, so when ordering, make sure to convert to USA sizing by adding a size for men, two sizes for women. How about a women’s work shoe that is work boot-strong? That’s what Caterpillar boasts of on their latest entrant to the Top 20 Best Steel Toe Work Shoes for Men, Women in 2019 list. The Caterpillar Women’s Brode Steel Toe Work Shoe is made with a gorgeous, supple, yet sturdy and durable suede-leather upper. The steel toe box is roomy so your toes won’t pinch, yet constructed to meet and exceed American Society of Testing and Materials (ASTM) safety-test standards for compression and impact. While on the subject of ASTM testing, the Brode Steel Toe Work Shoe also meets and exceeds tested standards for water-, oil-, and slip-resistant surfaces as the rubber outsole has premium traction and support. The outer sole passes ASTM standards for electrical hazard protection which is great to guard against block shocks. The insole is constructed with a Nylex material as well as a molded ethylene vinyl acetate (EVA) footbed for outstanding support and superior cushioning. A soft yet durable nylon lining is in place for excellent breathability. A design with cement construction was added to add exceptional durability and flexibility. Designed specifically for a woman’s feet, Caterpillar made sure to design a shoe that is stylish but provides the premier protection women need when on a work site. Wolverine’s return to the list of Top 20 Best Steel Toe Work Shoes for Men, Women in 2019 is a dandy. A true slip-on steel toe work shoe — yes, slip-on! — this stylish, comfortable, and durable shoe is the Wolverine Women’s Bailey Steel Toe Slip-On. Designed specifically for working women, Wolverine added stylish comfort women have been demanding for years and they’ve done so by also managing to pack in tons of safety and protective features. The Bailey was designed and made with Opanka construction, which is a sturdy, hand-sewn material in the upper, the outer sole, and the sock lining, all in a single process. It’s also a type of construction that allows for the footbed to be constructed with three foam comfort layers, for exceptional cushioning and support. The midsole is also made of durable ethylene vinyl acetate (EVA). The removable sock liner is made with a pillow-like material to cradle the feet with comfort. The upper is full-grain leather, which is supple yet durable. The steel toe box is roomy to avoid pinching, and sturdy as it meets and exceeds American Society of Testing and Materials (ASTM) standards for impact and compression. Stylish yet ultra-lightweight, the Bailey is a marvel. The Caterpillar Women’s Switch Steel-Toe Work Shoe is ready for any job site you happen to work in. That’s because Caterpillar, the world’s leader in manufacturing heavy equipment, knows a thing or two about job sites, so they took that knowledge and put it into a steel toe work shoe for women. Material for the upper portion of the shoe is a nylon mesh with direct inject polyurethane (PU). The lining is also nylon mesh, and the removable sock liner is a molded ethylene vinyl acetate (EVA) and Nylex material. This material is to allow for maximum comfort and breathability with the sturdy leather overlays. The midsole is a dual-density EVA material. The overall construction design is Strobel and Construction, specifically made for steel toe work shoes. The rubber outer sole is built for exceptional traction and to withstand rugged work environments and also meets and exceeds the American Society of Testing and Materials (ASTM) standards for oil-, water-, and slip-resistance. The steel toe box meets and exceeds ASTM standards for compression and impact. The Caterpillar Women’s Switch was designed, constructed and inspired by the top athletic shoe designs, as it wears as a low-profile work boot, yet feels like you’re wearing an athletic shoe all day. Skechers returns to the list of the Top 10 Best Steel Toe Work Shoes for Women in 2019 with the versatile, comfortable, and durable Skechers for Work Women’s Sure Track Vonn Slip-Resistant Slip-On. This splendid steel toe work shoe for women is exceptionally comfortable and easy to wear, as the slip-on design is a real time-saver for those that need to get in and out of their shoes rapidly. The upper is made of genuine, full-grain leather, which is durable, yet supple and soft. It’s the type of work shoe for women that goes with any uniform and will last a long time. The slip-on style is made possible because of the dual-side elastic panels built in. The lining is a soft fabric material and the design is Skechers patented Relaxed Fit, so the shoe is roomier and a more comfortable fit. The cushioned insole is removable with an added layer of plush Memory Foam. The nitrile rubber outer sole meets and exceeds American Society of Testing and Materials (ASTM) standards for slip-resistance, particularly for surfaces that are oily and wet. The shoe also meets and exceeds standards for toe protection (compression and impact) and electrical hazards. The midsole is made with FlexSole, an ultra lightweight, and shock absorbing material. The penultimate entrant of the Top 20 Best Steel Toe Work Shoe for Men, Women in 2019 is from Timberland’s Pro Powertrain series of work shoes, specifically designed for industrial safety. Timberland has added features to the Timberland Pro Women’s Powertrain Sport Alloy Toe SD+ Industrial and Construction Shoe you won’t find anywhere else. It’s not just that Timberland has unique technology, they’ve created a shoe with superior safety, comfort, and durability. While affordably priced, these are not shoes you’re likely to find on a discount rack. The steel toe box is built with an alloy called TiTan, and it meets and exceeds American Society of Testing and Materials (ASTM) safety standards. The outer sole is dual-density and built with an anti-fatigue technology for shock-absorption and the ultimate in comfort and durability. It’s built with cement construction with a fiberglass shank. The outsole also meets and exceeds ASTM safety standards for slip-resistance, electrostatic discharge, and electrical hazards. The shoes were designed to be worn in an office environment and also in rugged job sites and warehouses. The uppers are made of a Ripstop nylon material and made to be mutilation-free. Timberland’s Pro Powertrain Sport work shoes are designed for the ultimate in performance and comfort, guaranteed. We complete the list of the Top 20 Best Steel Toe Work Shoes for Men, Women in 2019 with a final offering from Keen’s Utility line of work shoes. The Keen Utility Women’s Mesa ESD Steel Toe Oxford was designed and constructed specifically for a woman’s feet and built to last and provide all-day comfort and fit. It’s made with an outer sole that protects against static electricity and meets and exceeds American Society of Testing and Materials (ASTM) standards for electrical hazards, and is electrostatic dissipative (ESD). It also meets and exceeds ASTM safety standards for water-, oil-, and slip-resistance with the Keen Grip, non-marking outsole, and the steel toe box is anatomically correct and left and right asymmetrical. The protective steel toe box is also roomier — to avoid pinching toes — and provides excellent protection against compression and impact. There is exceptional arch support built in, with a naturally contoured footbed that cradles the foot. The footbed is metatomical, dual-density and removable and made with ethylene vinyl acetate (EVA) material. The exceedingly comfortable lining features a hydrophobic and hydrophilic technology which provides two-zone comfort. The lacing system is a traditional lace-up design. Oh, and the Mesa is also water-resistant. Is It Important to Wear Steel Toe Work Shoes/Boots? Absolutely! Ok, so we answered the question of whether it’s important to wear steel toe work shoes already. So let’s accept this as fact and move on to the explanation of why it’s important to wear steel toe work shoes. We’ll look into the top features your steel toe work shoes should have, and also why it’s important for women to find steel toe work shoes made especially for them. Steel toe work shoes or safety shoes are a requirement for some job sites, and for places where it’s not a requirement, it’s a superb idea to wear shoes that will protect your feet wherever you go. Many shoe manufacturers have designed and constructed work shoes that are loaded with features that will protect your feet no matter what type of job site you are working at. Shoe manufacturers have also finally started making steel toe safety shoes specifically for women, rather than forcing them to shop for smaller men’s work shoes and boots. Heavy-duty footwear such as those that are the focus of this Top 20 Best Steel Toe Work Shoes for Men, Women in 2019 are ideal for folks who work in jobs that are in warehouses, construction sites, or other types of work sites. Basically, if there are rugged environments, heavy equipment or tools, then you should be wearing shoes that equate to the environment. Gone are the days where bulky, and ugly boots are the only footwear choice. Nowadays, safety footwear comes in a variety of styles such as boots or low cut work shoes, even those that look like a fine pair of sneakers. And even though you may find an attractive pair of work shoes, every entrant on this list has a steel toe box that meets or exceeds the American Society of Testing and Materials (ASTM) safety standards. Work footwear has come a long way. Steel toe work shoes are necessary for those people who work in jobs around heavy equipment, tools, and environments with rough and rugged terrains where hazards such as sharp items, wet, slick surfaces, electrical impediments, and anything which could fall. Of course, there’s another issue which work shoes of old failed to consider, and that is the health of the foot for men and women. People who have foot problems, such as low or high arches, plantar fasciitis, heel issues, etc., can see these issues exasperated with bulky, heavy, and uncomfortable work footwear. Once again modern shoe manufacturers do attempt to take this issues under advisement and build in features to account for folks who have foot problems. Most modern safety footwear design in features that allows them to meet and exceed ASTM safety standards. This includes outer soles made with rubber that provides excellent traction for all types of surfaces and terrains, such as wet and oily surfaces, so slip-resistance is accounted for. And so is electrical hazards and electrostatic dissipative hazards. The steel toe box meet and exceed standards for compression and impact. And many of the steel toe work shoes on this list even have added a protective plate in the outer sole that makes them puncture-resistant to stepping on nails or other sharp objects. With shoe manufacturers making sure that their steel toe footwear is as safe as possible, this cuts down on the number of foot injuries workers have in any given year. So with better safety benefits, workers will be able to spend more time on the job. The primary functions should protect from objects which fall or fly since heavy materials are carried around the work environment, these are normal hazards that will be encountered. So steel toe work shoes can protect against these hazards. Heavy-duty and puncture-resistant soles are also an important safety feature as many workers will come across many different types of sharp objects on the job site. And machinery with sharp parts can pose hazards of a cutting nature, such as the logging industry, where machine saws and chainsaws are real hazards, so a shoe or boot that is sturdy enough to withstand these hazards could be a lifesaver. Work shoes made of non-conductive materials such as rubber, leather, or other materials that will not conduct electricity should be used, this allows for cutting down the amount of static which can build up in the body, and keep the worker from receiving shocks from exposed electricity. And the top accidents seen on the job site is probably attributed to trips, falls, and slips from wet and slick surfaces. So a shoe with excellent slip-resistant soles is an excellent idea, and every shoe on this list accounts for this hazard. Excellent traction also allows works to plant their feet more securely on ladders or rugged surfaces. Steel toe work shoes and boots should also account for weather-related obstacles so they should be water-resistant and protective against extreme weather conditions like cold and heat. For years women were sorely underrepresented when it came to work shoes that were made specifically for them. Women were forced to shop in the men’s work shoes department for sizes that fit them, and usually, those shoes didn’t fit them precisely. Nowadays many shoe manufacturers have designed and constructed work shoes specifically for a woman’s unique anatomically different feet. Plus, women carry water weight differently than men, during certain times, and this can cause swelling and other foot issues. So now a woman can shop for steel toe work shoes that have all the advanced safety features the best men’s steel toe work shoes or boots have but also made with designs and styles that are more fashionable. As industrial and construction jobs are filled by more women, this allows them to not just feel included in the industry, but also they are offered the comfort and safety when it comes to footwear. She updated this page on 2019-01-19 and will continue to update it as time goes on. 3 Is It Important to Wear Steel Toe Work Shoes/Boots? Absolutely!